I consider myself very fortunate to have dined at Urasawa five times (August 2009, March 2009, October 2008, May 2008, November 2006), and even more fortunate to have had my last meal here paid for. Thus, I never would've imagined that my sixth visit here would be gratis as well! Regular readers may recall my recent, epic 21-course meal at The Dining Room. Well, my two friends wanted to celebrate their newfound wealth in an even bigger way, and thus put me in charge of setting up a $1,000 per person (food only) dinner at Urasawa. Ecstatic with this idea, I called up Hiro-san, but he declined the offer, saying that raising up food costs to the $1k level would require the use of some "questionable" ingredients. Given the recent, well-publicized shutter of The Hump, I didn't press the issue, and "settled" on the standard menu. We still wanted the meal to be extra special though, so we decided to pair the food with an absolutely amazing horizontal tasting of 1995 Champagnes. Urasawa's interior space had been subtly upgraded recently: walls have been covered with new wallpaper, and new beams of cypress wood have been applied to various surfaces as well. We began with a welcoming glass of the 1995 Salon Champagne Brut Blanc de Blancs Le Mesnil. This was actually my first time having Salon, and I appreciated its interplay between dry, toasty, biscuity flavors and floral, fruity flair, especially on the midpalate. Very nicely balanced, with pleasing acidity. 1. 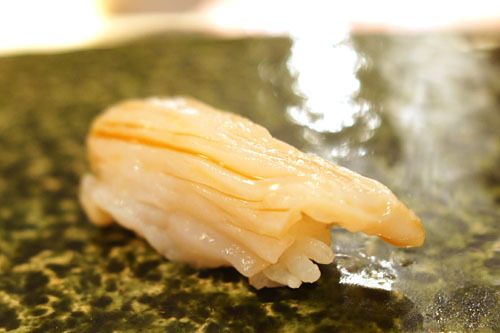 Junsai - Urasawa remains the only place where I've had the summer delicacy of junsai, or water shield. 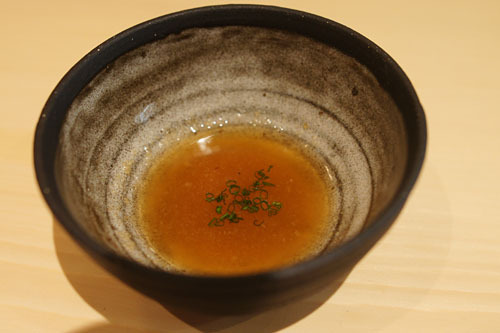 The best part of the plant is the viscous, gelatinous layer that covers young sprouts, and here, the junsai was served, in shooter form, with scallop, wasabi, shiso, Kyushu turnip, and yuzu zest. I quite liked this dish, with its savory, umami-rich attack transitioning to a subtly sweet, lingering finish. 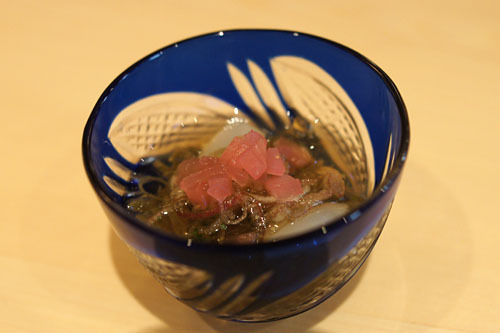 I also enjoyed the junsai's slippery texture and the crunch of the radish. A great way to kick off the meal! 2. Goma Tofu - A traditional Kyoto dish, this wasn't really tofu at all, but a commixture of water, sesame paste, green tea (matcha), and kudzu starch. 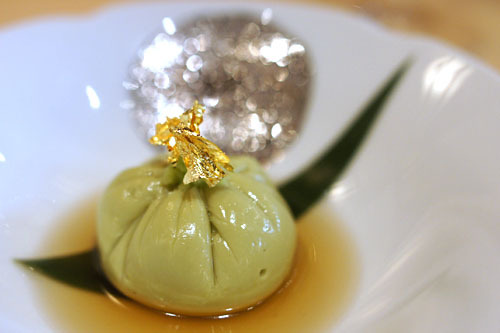 It came stuffed with uni and topped with wasabi and 23-carat gold flake. The flavor of sesame was strong initially, but this then gave way to the slight bitterness of the matcha, while the wasabi added a great burn on the finish. I really appreciated how the "tofu" emphasized the inherent sweetness of its uni filling. 3. 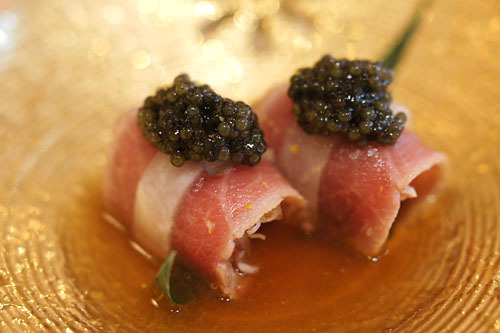 Toro-Senmaizuke Maki - Here we have a dish of monkfish liver (ankimo) and shiso, all wrapped in seared toro and senmai-zuke (pickled shogoin kabu turnip), topped with Petrossian caviar, in a yuzu-based sauce. An amazingly complex and balanced course, the maki was salty on the attack, no doubt thanks to the caviar, but then transitioned to the creaminess of the ankimo intermixed with the tartness of the turnip, while the use of toro grounded the dish. 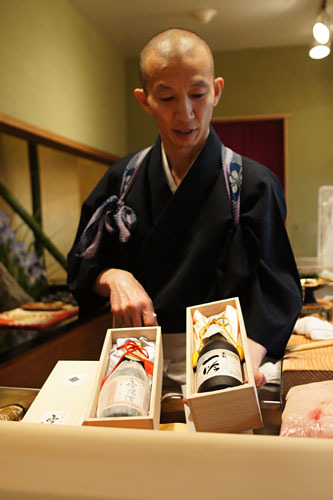 With our first bottle of bubbly dispensed with, we wanted to move on to sake, and thus asked for the off-the-menu, by-request-only, "special" collection of sake that Urasawa keeps. Above, Hiro-san shows us the two that he had in stock this particular night. 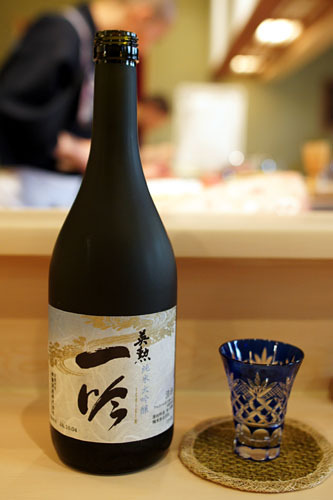 Hiro-san recommended that we start with the Ichigin Junmai Daiginjo [$350], which I'd also had on my fourth visit here. Made by Saito Shuzo in Kyoto Prefecture, it's a 35% seimai-buai, yamada nishiki rice sake not typically found in the States; the Chef's mother had to personally send this particular example. As I said before, this was easily one of the best sakes I'd ever tasted. It was thick, viscous, and ever so slightly hot, with a strong, present backbone of rice intertwined with a soft fruitiness and floral character. Superb. 4. Karasumi - We couldn't have timed the sake better. 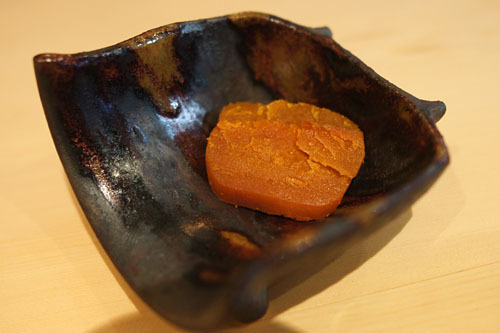 The next course was karasumi, a delicacy of dried mullet roe that's meant to be eaten with sake. I've only had this in Japan previously. I first tried some alone, and found its saltiness surprisingly mild; I was also intrigued by its dry, grainy, almost cheese-like consistency. Next, I tried the roe with sake, and found that the sake actually intensified the karasumi's brine, while the sake itself had its alcoholic notes augmented. 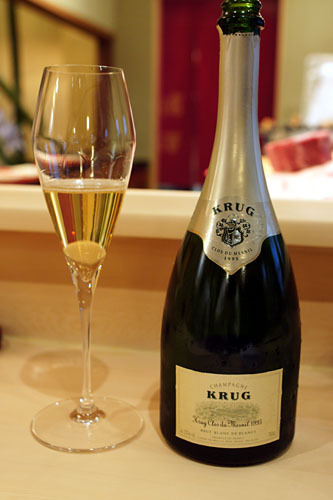 We brought three bottles of Krug, the first of which was the standard vintage 1995 Krug Champagne Brut. This was classic Krug: toasty, oaky, dry, with a hint of nuttiness and caramel. 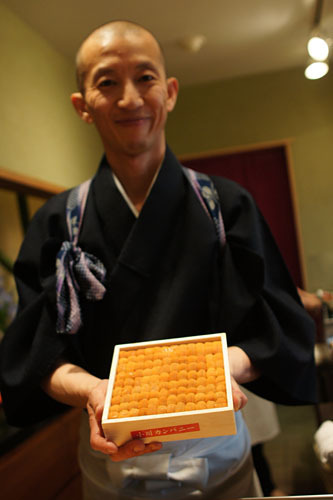 Hiro-san shows off a beautiful box of Hokkaido uni, to be used for the next course. 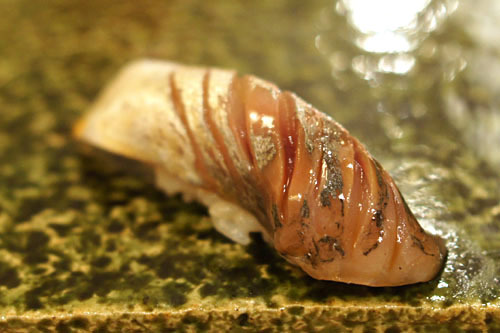 Shima Aji - This was my first time having shima aji, or striped jack, in sashimi form at Urasawa. 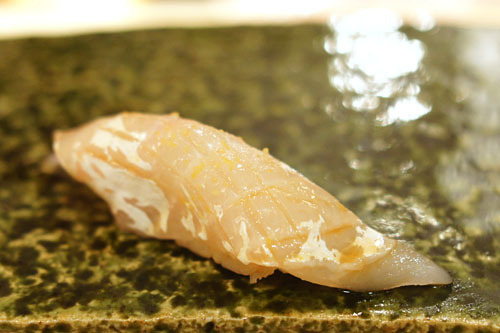 This particular fish was from Kyushu, and showed a great interplay of lean and fat, along with a simply marvelous texture. Good alone, but great with the wasabi. 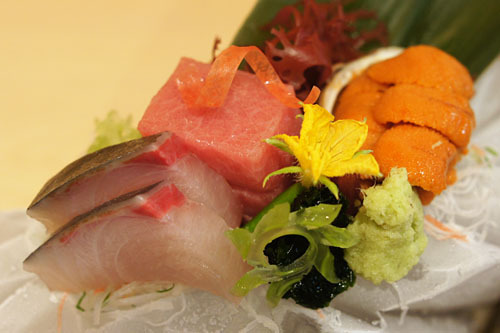 Toro - Toro, on the other hand, is a constant sashimi selection here. The tuna tonight was from Malta, and was suitably oily and fatty, yet slightly tendinous, with a certain lusciousness that comes to the fore upon mastication. 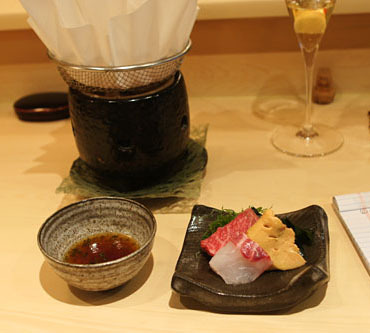 Having the toro with the soy and wasabi was key, with the two elements nicely countering the sheer luxuriousness of the fish. Uni - And here was the aforementioned Hokkaido uni. Compared to most others, it was easily more concentrated in flavor, with an intense brine inextricably linked to an oceany sweetness. 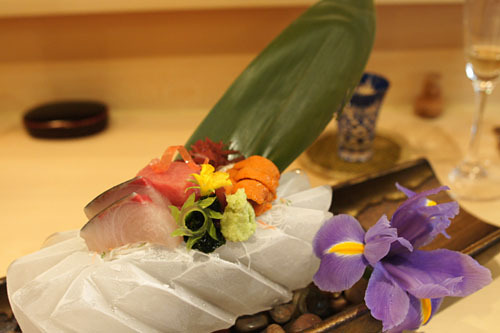 Accompaniments included fresh wasabi from Shizuoka Prefecture, shoyu from Wakayama Prefecture (the birthplace of soy sauce in Japan), nori, red cabbage, grated daikon, cucumber flower, and carrot. 6. 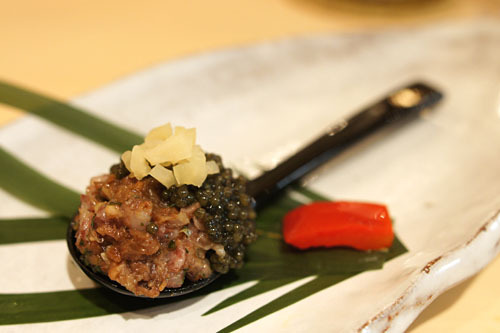 Wagyu Tartar - A heaping spoonful of wagyu beef, caviar, and pickled radish was presented with a singular piece of pickled red bell pepper. Taking it in one big bite, I first noted a tart attack, dominated by the radish. This was joined in the midpalate by the savoriness of the beef, which lasted all the way to the finish. The saltiness of the caviar, meanwhile, took on more of a supporting role. The most fascinating part of the dish, interestingly, was the bell pepper; pleasantly piquant, it cut the weight of the other ingredients nicely. 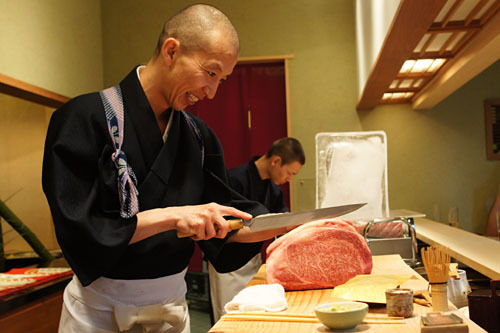 Here, Hiro-san delights in cutting into a huge chunk of Kobe beef (the real deal, from Kobe--just look at that marbling!) for use in our shabu-shabu course. 7. Sake-Steamed Red Snapper - We were presented with these lovely iron pots, to which Hiro-san subsequently added sake, resulting in billowing clouds of steam--nothing wrong with a bit of theatrics! 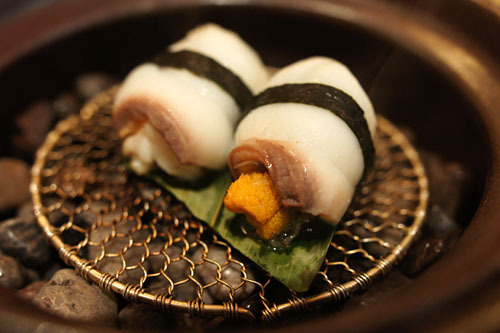 We then opened the pots to find shrimp, shiitake, uni, shiso, and miyoga, all wrapped up in tai snapper and nori. 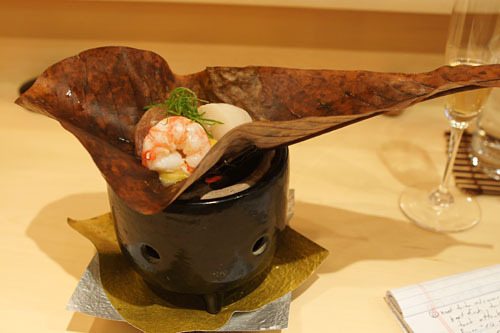 The fish really served as a base to the dish, a place where the sweetness of the shrimp and uni played beautifully with the vegetal tang of the shiso. The briny counterpoint from the nori was commendable as well, as was the paired oroshi ponzu (ponzu with daikon) dipping sauce. I also loved the stark temperature contrast between hot and cold--the interaction between warm snapper and its cool accompaniments. 8. Houba-Yaki - This was another brand new experience for me. 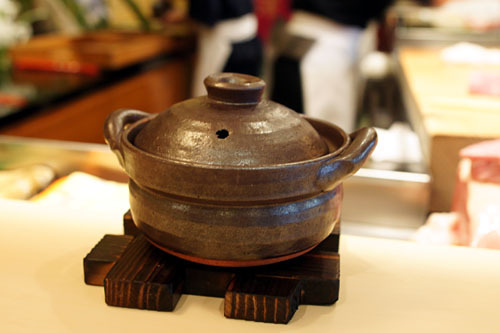 Originally from the Hida region in Japan, houba-yaki takes its name from the houba leaf of the Japanese Magnolia. Various ingredients are cooked in the leaf, thus garnering some of its aroma, and served with tamamiso (miso with egg, mirin, sake, sugar). 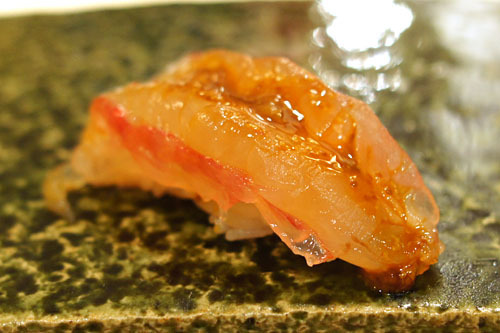 I first tried the shrimp, which came from Santa Barbara; it had a superb, crisp texture and light sweetness that was augmented by the sugary miso. Next up was the scallop, from Hokkaido, which had a very finespun, delicate sapor that was somewhat overwhelmed by the tamamiso unfortunately. Finally, we come to my favorite of the troika, more of that delectable Kobe beef; its rich, unabashedly ambrosial savor held up wonderfully to the sweetness of the accompanying sauce. We wanted to taste all three Krugs back-to-back, so the next bottle we opened was the 1995 Krug Champagne Clos du Mesnil, a single vineyard, blanc de blancs (100% Chardonnay) bottling. Compared to the preceding wine, this still showed plenty of that quintessential Krug character, but was steelier, lighter, and more mineral driven. I preferred it to the standard vintage Krug. 9. 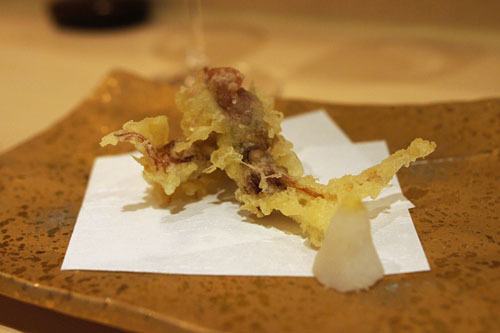 Hotaru Ika Tempura - From Toyama Prefecture comes hotaru ika, or firefly squid, served here in tempura form. I really appreciated the squid's inherent brine, and how its flavor was so eloquently moderated by its crispy layer of fried tempura batter. 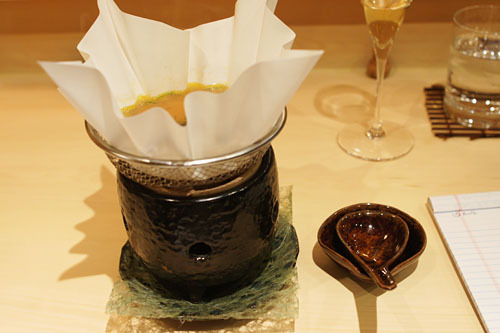 Not surprisingly, the ika was served with a tentsuyu dip and a triangular mound of grated daikon and ginger. The sauce further enhanced the dish, contributing a tart and tangy component that paired quite nicely with the dish's salty character. 10. Shabu Shabu - The shabu-shabu course, a holdover from the old Ginza Sushi-Ko days, is always one of the most hotly anticipated items at Urasawa. 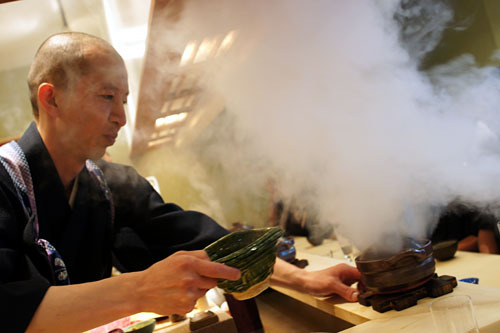 Either Hiro-san of one of his staff members will do all the cooking for you. 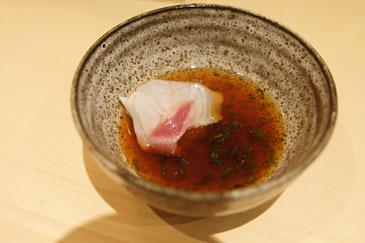 First to take a plunge in the dashi bath was the red snapper. In and out in a jiffy, I loved how the fish's brininess was very succinctly preserved. Next to go was the French foie gras. It was cooked for a noticeably shorter time than in prior meals, resulting in a delightfully tender, creamy consistency and mild, pure, focused foie flavor that impressed us all--it's still some of the best I've had. Finally, we were presented with the wagyu, which had a subtle, yet profound savor that went beautifully with the tang of the included scallions. 11. 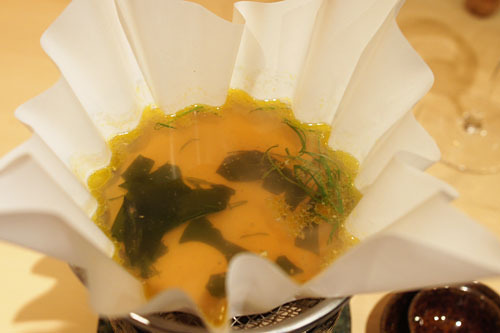 Shabu Shabu Broth - The remaining shabu broth is always a hot, heartwarming, umami-rich treat. The key here is the foie gras, which provides for a heavy, hearty stock positively saturated with the essence of liver, but yet countered so superbly by the vegetal tang of scallion and kombu. As always, the presentation of the gari (ginger) signifies the start of the sushi. 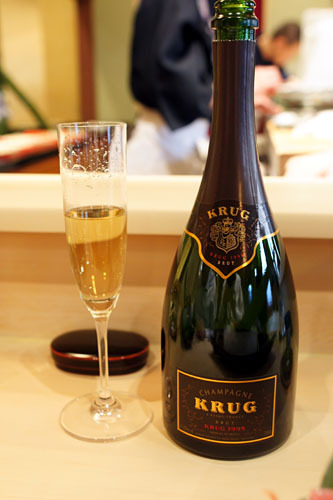 And finally, we come to the 1995 Krug Champagne Clos d'Ambonnay, a single vineyard, blanc de noirs (100% Pinot Noir). Released in April 2008, this is currently the only vintage of Clos d'Ambonnay available, and only 3,000 bottles were produced from a lone 1.69 acre vineyard, making it easily the rarest and most expensive Krug Champagne ever (and the priciest liquid to ever pass my lips). The nose on this one was Krug, no doubt, but on the palate, this was a much softer, rounder, more feminine sparkler, with surprising dark berry notes over a backbone of delicate toastiness. It was delicious, and actually the most approachable Champagne of the night! 12. Toro / Tuna Belly - As always, the sushi gauntlet begins with toro. Superbly rich, fatty, and melt-in-your-mouth (just look at that marbling), it was beautifully tempered by the rice and accented by the sharp burn of wasabi. 13. Kama Toro / Tuna Collar - As unctuous as the toro was, the kama toro (a little known cut of fatty meat from the tuna's collar) was even more so. Yet, at the same time it wasn't overbearing, with the savory bitterness of the char adding a wonderful counterpoint to things. Arguably the most decadent piece of sushi I've ever had. 14. Kanpachi / Amberjack - What impressed me here wasn't so much the flavor of the fish--though certainly it was quite tasty--but the kanpachi's impeccable texture, a fantastic mix of crisp and creamy. Nice. 15. 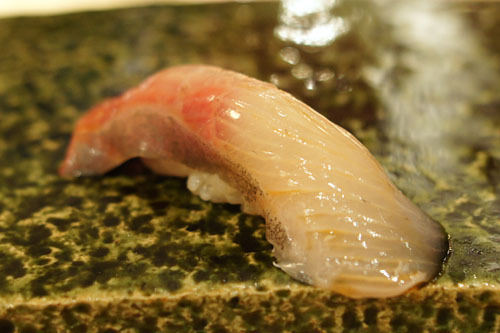 Aji / Spanish Mackerel - This was a prototypical example of aji, one of my favorite types of fish for sushi purposes. As expected, it had a strong, but not overwhelming flavor, which was deftly tempered by the application of yuzu and wasabi. 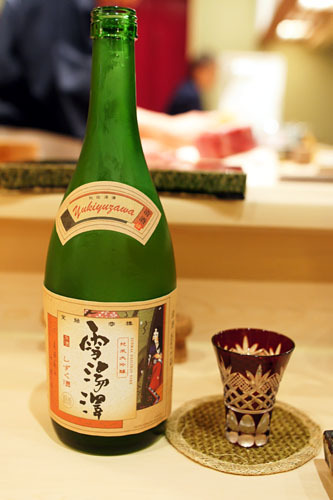 If you think that the 3,000 bottles of Ambonnay makes it rare, consider that only 300 bottles of Yukiyuzawa Junmai Daiginjo [$350] are produced each year. As with the Ichigin, this is a 35% polished, yamada nishiki sake, but the two couldn't be more different in terms of taste. This was a much drier, much more austere tipple, with just a hint of floral character interspersed with some juicy melon notes. 16. Tai / Red Snapper - I loved the application of yuzu zest here, which gave the fish a delightful citrus tang. What was more interesting, though, was its consistency, which I found crunchy, snappy, even a bit sinewy. 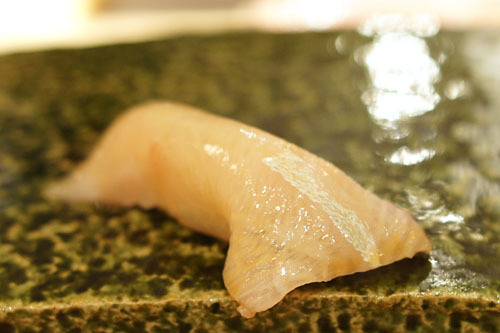 One of my dining companions likened it to engawa, or halibut fin. 17. 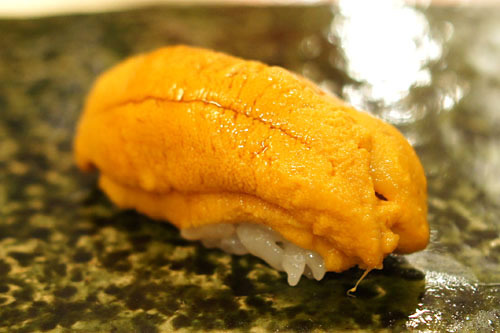 Uni / Sea Urchin Roe - Earlier in the meal, I was able to enjoy Hokkaido uni. 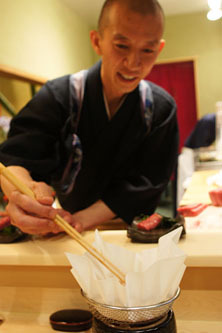 The example used for sushi, however, hailed from Santa Barbara, and it was great to have an opportunity to compare the two styles back-to-back. We're talking a night-and-day difference: this was clearly creamier, more luscious, with a sweeter, less intense, more feminine flavor. 18. 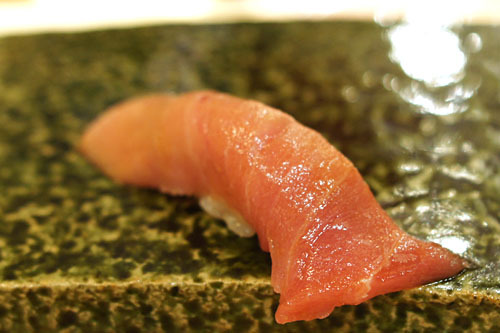 Maguro / Tuna - I often lament the fact that tuna is one of the more boring types of sushi around. This, thus, was a pleasant surprise to me, as I found the fish remarkably full flavored, with a sharp, salty savor that really got to me. 19. 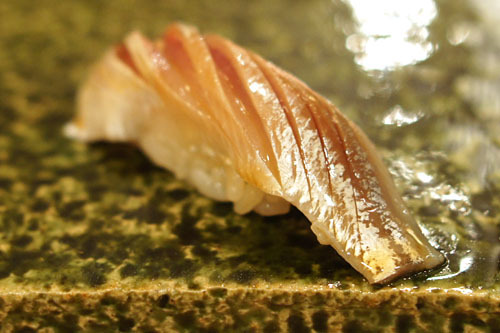 Shima Aji / Striped Jack - The shima aji at Urasawa has often times been the strongest sushi of the lot, and although it didn't achieve such heights this time, the striped jack was a valiant effort nonetheless: snappy, savory, with a subtly sweet shade. Nice. 20. Ika / Squid - Urasawa's squid always possesses a creamy, chewy, mouth-coatingly monolithic consistency. Taste-wise, I found it subtly sweet, aptly accented by the application of grated sudachi and salt. 21. 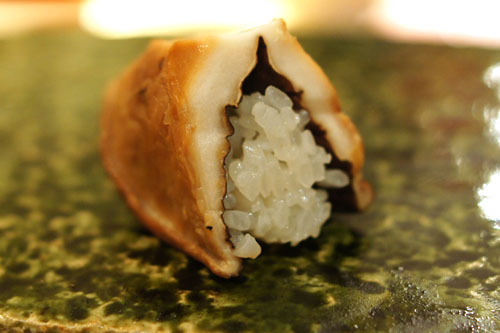 Shiitake / Mushroom - One of the highlights for me is the shiitake nigiri sushi. The earthiness of the mushroom is so forcefully conveyed here, and yet is so beautifully accompanied by the wasabi and rice. I could've used more of this! 22. Chu-Toro / Medium Tuna Belly - This was actually very close to the regular toro above in terms of tenderness; it was, perhaps, only a touch less oleaginous, but still very, very good. 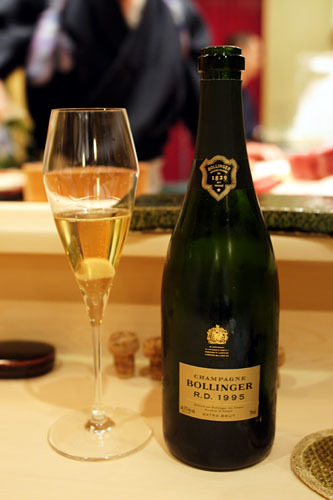 If Clos d'Ambonnay was the most approachable wine of the night, then the 1995 Bollinger Champagne R.D. Extra Brut was easily the most challenging. It was tremendously dry, austere even, with loads of toast and yeast paired with an oxidative complexity and funkiness. Several of my dining companions did not like this one at all. 23. Kohada / Gizzard Shad - Kohada is always one of the more strongly-flavored fishes served, but this example was actually quite mild, with a delicate brine and a subtly saccharine savor. 24. 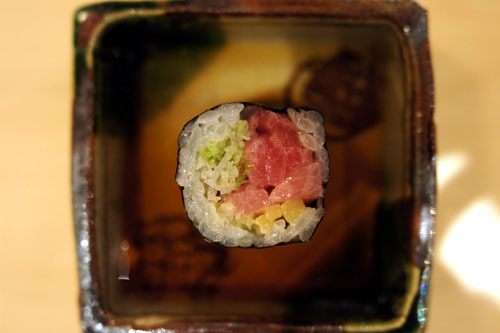 Negitoro Maki - Here was a maki roll of chopped toro, leek, and takuan (pickled daikon). 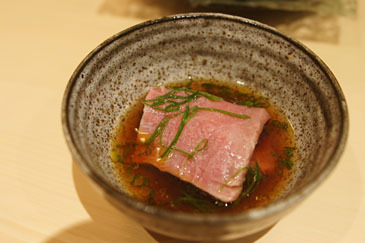 I loved the great crunch and tang of the takuan, and how the astringency of the leek so deftly tempered the gravity of the tuna. The overarching flavor of seaweed was superb as well. 25. Mirugai / Geoduck - Shellfish time, starting with geoduck ("gooey duck"). 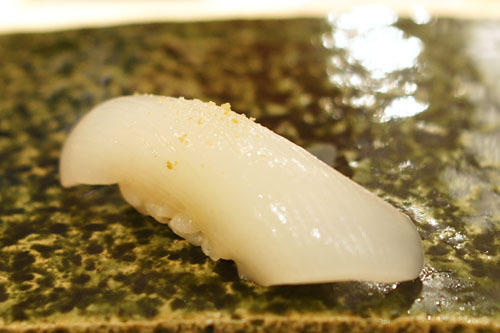 A very firm, crunchy texture gives way to a briny flavor underscored by a subtle sweetness. 26. 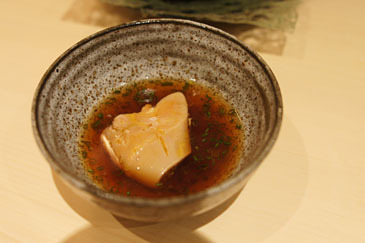 Awabi / Abalone - Abalone never fails to make an appearance at Urasawa, and always manages to demonstrate a certain fresh crispness. 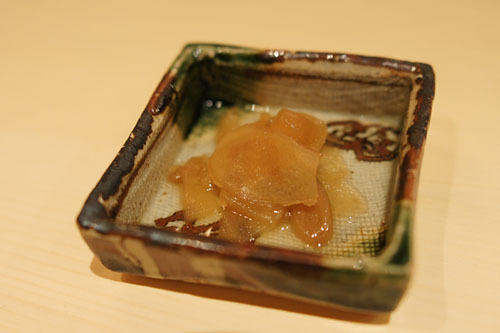 Grated yuzu, with its citric tang, is added to augment the awabi's natural sapor. 27. Amaebi / Sweet Shrimp - At this point, Hiro-san proceeded to bring out some live shrimp from under the counter, which he and Ken-san then broke apart--talk about fresh! This was everything that you'd expect from sweet shrimp: snappy yet creamy in consistency, briny yet sweet in taste. 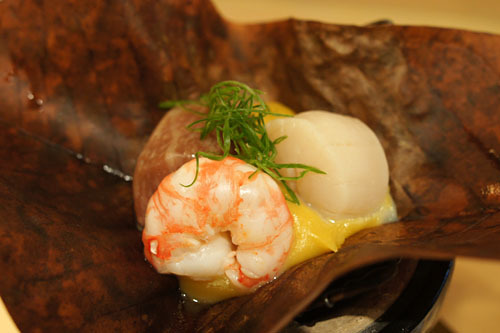 The amaebi was further elevated by the application of a sauce made from the shrimp's innards; this gave things a sweet-metallic tinge. 28. 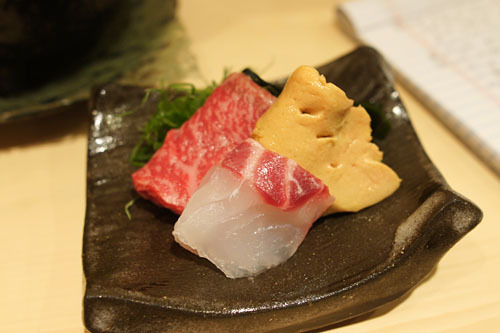 Gyusashi / Beef - One of the highlights here is always the lightly-smoked beef sushi. 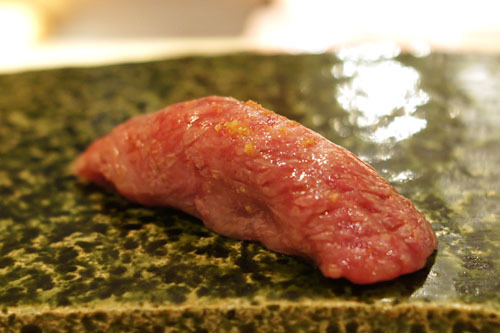 I loved the zesty attack of the grated yuzu skin, and how this transitioned to the sweet-savory flavor of the meat. A real crowd pleaser! 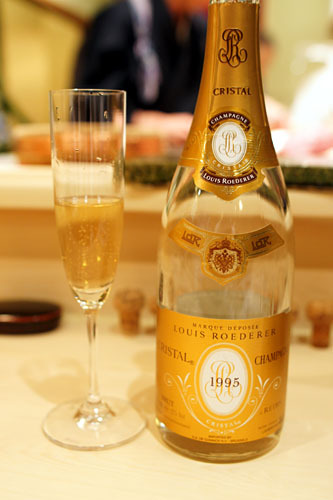 We ended our gamut of bubbly with the 1995 Louis Roederer Champagne Cristal Brut. As expected for Cristal, this was light, creamy, floral, and citrus-tinged, but given its age, it also had plenty of toasty character as well. Tasty, but probably the least complex of the sextet. 29. Anago / Saltwater Eel - Anago never ceases to make an appearance at Urasawa, and actually, this was one of the stronger versions I've had here. 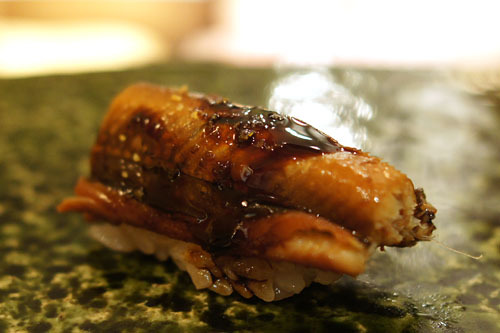 I found the eel light and lean, superbly accented by the application of sweet, sugary sauce and yuzu. 30. Tamago / Egg - Urasawa has one of the more unconventional preparations of tamago around. 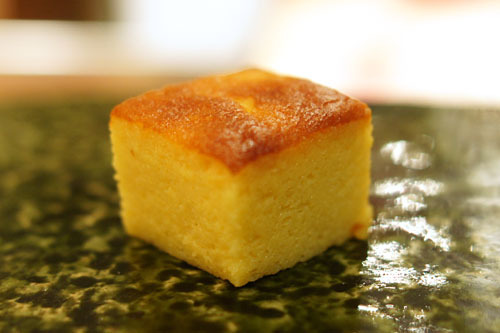 Instead of an egg omelet, you receive something resembling a cake, sort of like a datemaki. It's a spongy, fluffy, moist contraption, with a sweet, yet eggy flavor. 31. Papaya - What we have here was a slice of papaya, on which grapefruit jelly was somehow melded on to. The grapefruit, thus, added a fantastic sugariness to the dessert that complemented the papaya's naturally milder flavor. 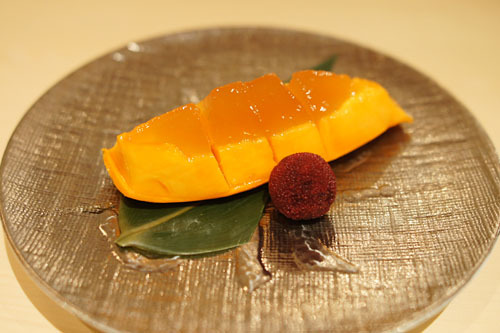 The mountain peach, or yamamomo, meanwhile, added a distinctly sourness to things. Absolutely delectable. 32. 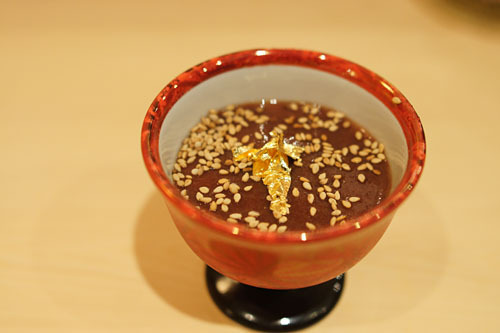 Goma Pudding - Next was a sesame pudding, topped with a layer of red bean paste, sprinkled with sesame seeds, and garnished with gold foil. This had a great base of sesame flavor, accented by the sweetness of azuki bean, while the sesame seeds provided a lovely earthiness to the dessert. 33. 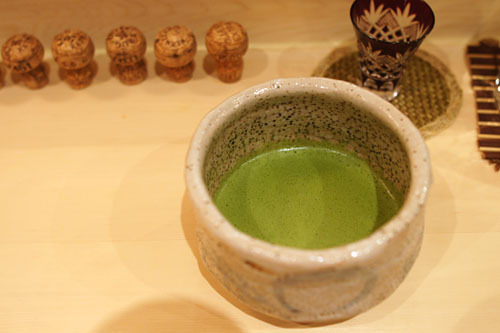 Matcha - With the sesame pudding came this frothy bowl of matcha powdered green tea. Its astringent, bitter flavor did a great job in tempering the sweets. 34. 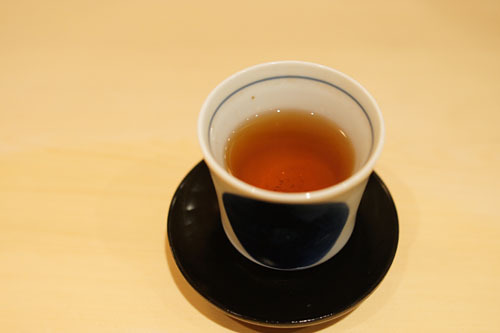 Hojicha - A meal at Urasawa always ends with a bottomless cup of roasted green tea. I limited myself to only two servings this time around! 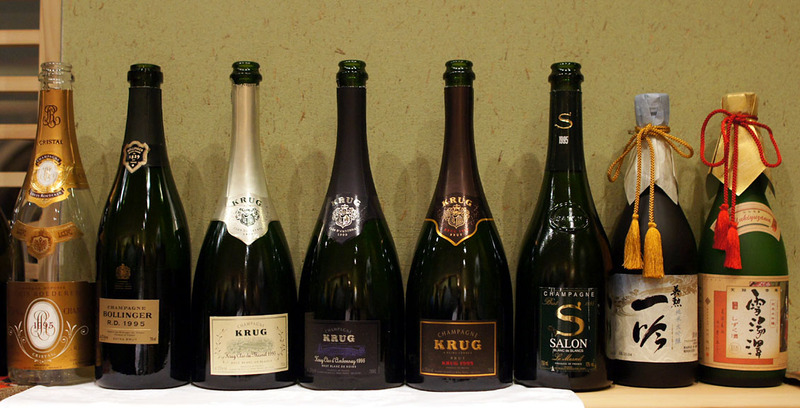 Above, we see the lineup for our 1995 Champagne horizontal (along with our sakes). Here's the pricing (inclusive of tax and shipping), in case you're thinking about doing a tasting of your own: Cristal - $367.99; Bollinger - $219.49; Krug Clos du Mesnil - $763.44; Krug Clos d'Ambonnay - $2,617.38; Krug Brut - $285.34; Salon - $318.43 We also had an extra bottle of 1995 Moët & Chandon Champagne Cuvée Dom Pérignon Oenothèque (a late-disgorged version of the cuvée) that we didn't get to--we'll be saving that for another dinner. As is tradition for Urasawa, we close with the posting of the night's tab. It was $6,370.45 with tip, and adding in the $4,572.07 for the Champagnes brings the grand total to $10,942.52, officially making this meal my most expensive ever, easily eclipsing my first experience at Joël Robuchon. And with that, another Urasawa dinner comes to a close. A visit here never ceases to bring a smile to my face, and what was supposed to be a "once in a lifetime" meal for me back in '06 has become at least an annual occurrence. I don't think that there's much more I can say about the place that I haven't already said, but I do recommend that everyone with an interest in food try to make it out here at least once--it's worth the wait, worth the effort, worth the cost. Thanks again to Eric and Minh for a wonderful meal. I hope you bring back the tradition of posting receipts with all your restaurant reviews; I miss that from the old kevinEats! It's really a shame you couldn't get a $1,000 menu. That would've been an impressive feat. Still haven't had a kaiseski only experience? (Not knowing much about champagne) - how did you get such detailed pricing about the bottles down to the penny and taking into account tax and shipping? I guess it's implied but did you order all these bottles recently specifically for this meal? Are 1995 bottles of premium champagne readily available online? I came across your blog from tastespotting and I'm so glad that I did. The food looks and sounds amazing. Even tho it's 1995, the 1995 vintage champagnes were only released about 5 years ago tops. They are all readily available on the market. 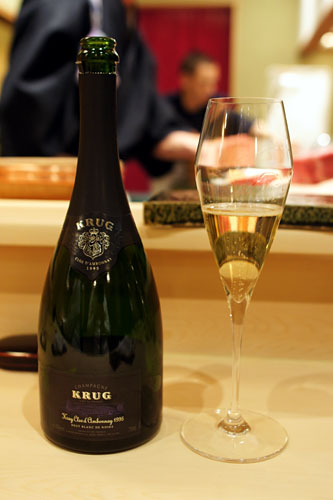 The most recent Krug release (just recently) is the 1998. 1995, 1996, 1998. Nice job on the Krug CDA Kevin! That is an epic bottling of wine. I also think the 96 is available now. 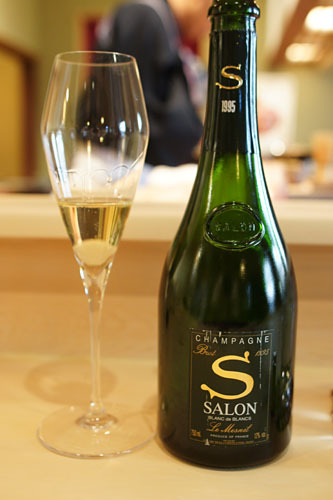 Also try the 96 Salon, you can get it for sub$300 and that's an epic bottle of Salon! Sounds like a great dinner with great champagne! oh wow. that looks like an epic meal indeed...i need to make friends with eric and minh. :0 btw, what kind of "questionable" ingredients are we talking about anyways? good post kevin! the food looks awesome. but the birthplace of soy sauce is china, not japan. Oh wow. Thanks for sharing. I may just make the leap to dine here. Unfortunately it has to wait until my Doc clears me to eat raw food again. Imagine not being able to eat anywhere for an entire year. For now, I'll live vicariously through you. Hi kevin, you know I love all your blog and I'm also a foodie. However I'm sorry to say that I don't agree with the "lets spend 1000 per person" philosophy. I believe it's unnecesarily obscene baring in mind the situation of the economy and therefore of many families. I think that restaurant blogging is for sharing with other people experiences, enjoy and have fun. The bragging part and I spent so much money as I said before is really tasteless. Nothing personal here Kevin, i've seen this many times in the states, simply you didn't strike as the type. Anyway as I say I hope you keep blogging, I love it but I just wanted to leave some food for thought. Hi Kevin, another incredible review. It's been a while since my last visit to Urasawa. How long was the feast? ...phooey. The internet abounds in blogs centered on oatmeal--it's alright, I think, if someone occasionally astonishes with aji. 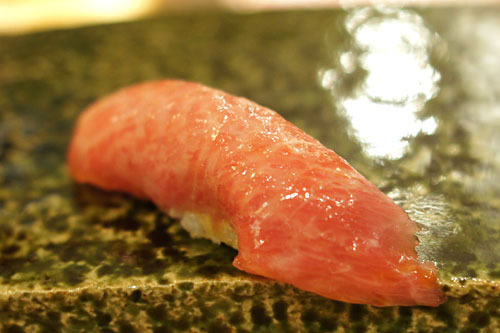 That maguro looks fab--simple thing, that when good, is so good. I'm starting to realize alot of food bloggers like to brag about where they've been and showing off their wealth. Hey, if you can afford it and that's what you want to spend your money on, good for you. I can't afford a dinner like that, but I enjoy reading about people who can. It does not bother me that some people are better off than I, because a lot of people are not. It's a far cry from those kids buying an iPad just to smash it. Per usual, an excellent and interesting post. 1) Kevin, after so many times at Urusawa, isnt some of the excitement/anticipation worn off? It seems that the menu is, for the most part, the same (albeit, filled with beautiful looking (and I'm sure tasting) food). 2) Concerning the amount of money spent, PulledPorker stated it perfectly (i.e., "smoke 'em if you got 'em"). The truth is, this type of spending is what our economy needs. Dont balk; it's true. And, if people want to spend $350 for dinner, by all means, please do, and b/c one can post such a lovely review, those of us who cannot afford it, can read a brilliant post that allows us to dine vicariously. wow, is there a list for the most expensive meals ever? Could you ballpark a total sans alcohol? I don't eat fish (or seafood, really) BUT...can your friends be my friends, too? Kevin when you lay down later tonight next to your glass of champagne and Godiva chocolates ... I suggest you read Theory of the Leisure Class. Might we say a bit of "Conspicuous Consumption"? For all the haters: get over yourselves. Kevin said this was a celebratory meal paid for by two guys who successfully sold their business. In that regards, this is hardly an ostentatious display of conspicuous consumption. And sure, I can't afford this meal, but I sure as hell still enjoy reading about it while enjoying my $5 home-cooked meal that probably satisfied me just as much -- just in a different way. Aaron: A shame indeed. We had a lot of newbies on this visit, so the "standard" experience was a must. Cynthia: Of course. And imagine how bad I would feel if Urasawa was shut down because of one of my blog posts! Darin: I imagine something along the lines of whale, fugu, maybe horse. BTW, how come I don't see Urasawa on your blog? You have a great selection of restaurants on there. Helen: Hiro-san does rotate courses seasonally, so there's always something new. When are you going to make it out??? Jai: Well I do still have that 1999 DRC Romanee-Conti sitting around in my cellar...It's pricier than all the booze here put together, but it'll probably be at least a decade before the wine sees the light of day. Kait: Great to have you stumble across here; please do come back! Charlie: We went with local retailers, so that's why prices were a bit higher. The only one from out of state was the Ambonnay, and that was over-nighted. ;) Also, is the '96 vintage available? We couldn't find a bottle, so that's why we went with 1995. Anon: Yep, left out the "in Japan." Fixed now! Jocelyn: Ouch, no raw stuff for a year? That's harsh. Seafood and meats both? Roberto: Your response is understandable, but my concern is: what defines "obscene?" Would the normal $500 meal here be obscene? $300? $150? $50? It's a slippery slope. Anon: Food bloggers? You mean people in general right? Anon: (1) Yes, the excitement has definitely been tempered over repeated visits, but the meals have yet to disappoint. (2) I like that rationalization. To quote Marge Simpson: "All right, I will buy it. It'll be good for the economy." Rodzilla: I'm sure that this meal wouldn't even come close to the most expensive ever. Remember, there are single bottles of wine that reach the tens of thousands of dollars. In any case, it was a $5000/$6000 split between food/alcohol. Misty: No seafood?!? That's food blogger heresy! Anon: No need for that--I've taken my econ classes. A Veblen good, that Ambonnay no? My last trip to Urasawa was, unfortunately, before I started my blog - it will definitely be added upon my next visit! Glad to see you were on top of the Red O opening. I'll be using your review as a reference point for my visit tomorrow! Darin, I definitely understand. I have countless pre-blogging meals that have been lost to time. Yup. Seafood, meats & vegetables. Nothing raw. Something about pesticides that could cause infections. It will be an interesting year. Hi kevin, whatever anyone spends is according to their purchasing power. It's not a matter of 500 or 300. What I'm saying is that I understand that you love urasawas mastery and you enjoy it there. It's expensive but you can afford it, so perfect. I'm just explaining that the end from my point of view should be the experience, the food, etc... Not spending huge amounts of money for the sake of it, because then it sounds like that's the important part. Anyway I don't want to get tangled in this discussion, I think you understand what I'm saying. In september I'll be in the west coast theoretically so I'll write for some recos. Interesting the WP post, I think I might check that. Yes, I definitely see your point Roberto. In any case, I'm curious as to where you'll end up here in LA. If it is indeed two fruits melded together than I assume he used Activa transglutaminase. Its a really interesting chemical that is safe to eat in your food and it has the ability to fuse proteins together. Transglutaminase only works with proteins though, right? I've never heard of it being used with fruit. I'm a big fan of your blog. I love reading your posts and imagining the dishes that you're eating (even though I'm a vegetarian!). 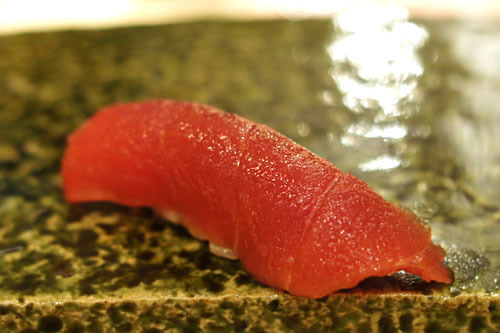 That being said, I read a well written, albeit bleak article about the fate of the bluefin tuna. I'm not sure whether you have read this, or are aware of the ecological crisis facing bluefin tuna stocks, but I thought it couldn't hurt to bring this to your attention. If this makes you or some of your readers take a second look at the food they eat, I think it will be worthwhile. Thanks. That was a good read Ravi. I'm curious as to how things will play out for bluefin in the coming years. Been reading your blog for ages and figured you might be able to help me out with a decision I have to make. I have the chance to have either Urasawa or the Providence Chef's menu - which would you recommend? I'm not from LA and might not be visiting again for quite some time, and as you seem to be the expert on the LA scene I thought I could defer to your experience :P.
I love the blog, by the way. My one comment would be this - cut out the next three meals that come your way and get yourself a plane ticket to Paris! It's quite an interesting comparison to the US food culture (or lack thereof). You can walk into any restaurant on the street and have a delicious three hour, 3-4 course meal with wine for 20 to 30 euro a head, and the high end places are unbeatable. The main thing that grabbed me, though, was how much more seriously food is taken over there. Everyone buys fresh bread every day, everyone goes to the market to get their produce, the butcher to get their meat, the cheese shop for cheese, etc. I've never been anywhere like it in the world. 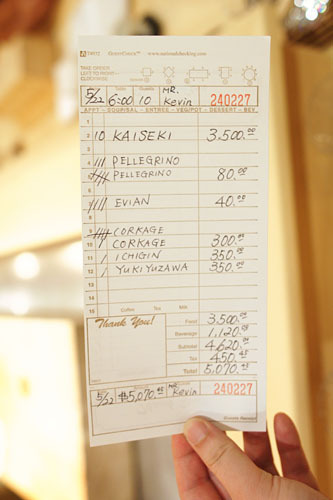 John, Urasawa and Providence aren't really comparable restaurants--totally different styles, and Urasawa is 2x the cost! That being said, I'd probably still go with Urasawa though, as I feel that it's a more unique experience. Only Masa in NYC can compare. 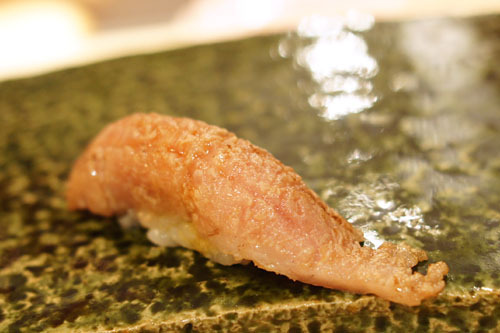 Kevin: Given the current situation in Japan, do you know what restaurants like Urasawa and other high-end sushi places are doing with sources of their fish? That's a good question. I don't think that there will too much of a disruption, given that Urasawa sources his fish from a variety of locations, and even his Japanese stock isn't concentrated in the Sendai area. Kevin! You're such a baller! That's the most expensive restaurant bill I've ever seen! I lost all my photos of Urasawa when my old hard drive decided to die. :( Oh well! Yours are infinitely better anyways. :) When's the next time you are going? I'm thinking of checking Urasawa out again at the end of this month. Is it a good time to go? It's the most expensive bill I've seen too--I'm lucky that I didn't have to pay for it. I actually don't have any plans to visit Urasawa in the near future, but I would consider waiting until fall when it's matsutake mushroom season.